WASHINGTON—For 35 days President Donald Trump—aided and abetted by Senate Majority Leader Mitch McConnell—locked out 800,000 federal government employees from their jobs. Mr. Trump eventually relented and signed a short-term deal to reopen the government, but made it clear that he might shut down operations again if he doesn’t get funding for a wall on the southern border. The president set a Feb. 15 deadline for resolving the issue. Federal workers and their families are relieved but are also watchful, saying they’ll continue to be careful how they spend what they have because they may be facing similar challenges again. Horatio L. Fenton, a union leader and Internal Revenue Service employee, said it’s cruel for Mr. Trump to have locked out federal employees and now threaten to repeat the pain. During the lockout, some wheels of government ground to a painful halt. Air traffic controllers, NASA employees, airport security personnel, Secret Service agents, and employees of the Federal Bureau of Investigation were some of the federal employees left dangling in this high-stakes power play by Mr. Trump and Sen. McConnell. Nine federal agencies were shuttered: Treasury, Homeland Security, HUD, Agriculture, Interior, Transportation, State, Justice and Commerce. About 420,000 essential employees worked without pay and an additional 380,000 federal workers were on furlough. Mr. Trump demanded $5.7 billion and House Speaker Nancy Pelosi and Senate Minority Leader Chuck Schumer refused to agree to his terms, or negotiate any money for border security until the shutdown ended. Speaker Pelosi held firm and outmaneuvered Mr. Trump, calling his bluff. He capitulated. His final offer was a “compromise” giving Dreamers, a class of immigrants brought to America while children, a three-year reprieve and protecting immigrants who are under temporary protection from immediate deportation. House Democrats voted 10 times to reopen government but their efforts were stymied by Mr. McConnell and President Trump. Mr. Fenton likened what federal employees endured to Post-Traumatic Stress Syndrome (PTSD). Milwaukee native Dr. Ramel Kweku Akyirefi Smith agreed, saying workers’ morale sagged, while the strain continues to wear on them physically and psychologically. Federal employees who were off work were not limited to the Washington, D.C. metropolitan area, but were at locations around the country. There was an increase in dysfunctional behavior, drug use went up significantly, as did suicidal ideation and depression, he added. Federal employees who marched and rallied seeking to force a reopening of government characterized themselves as collateral damage, pawns, they said, of the attempt by Mr. Trump to exact billions from Democrats to build a wall that most of them think is not worth it. 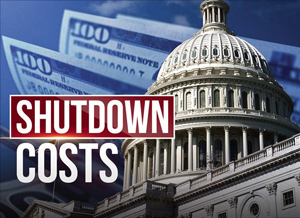 Federal employees told The Final Call they had to contend with college tuitions, daycare, loans, mortgages, food costs, medicine and health care premiums and any number of other expenses. Mr. Fenton said between two million and three million people—family members and loved ones of the 800,000 federal employees—suffered the effects of the lockout to varying degrees. The cascading effects were felt in the hospitality business—hotels, bars and restaurants—and affected cabs, Uber and Lyft drivers. Small businesses like barbershops, hair salons were hammered. Then there are 1.2 million federal contractors who were forced to stay home from work, did not get back pay and may never recoup those losses. Bloomberg estimated that the shutdown cost federal contractors about $200 million a day in lost or delayed contracts, and a Business Insider story said affected federal workers had more than $400 million in mortgage and rent payments due in January, a situation with the potential to roil the U.S. housing market. The shutdown had a disproportionate effect on Black workers and their families. That’s because Blacks make up a higher percentage of federal workers than they do the non-government workforce. Historically, Blacks have found some stability, security and decent wages in the federal government and less overt discrimination than in the private sector. Through it all, President Trump and Sen. McConnell were unmoved by the rising tide of anger and protests. There were several examples of a tone-deaf administration which infuriated the public and federal employees. Billionaire Commerce Secretary Wilbur Ross said in a Jan. 24 television interview that he didn’t quite understand why federal employees were going to food banks, saying there’s no real reason they couldn’t get a bank loan since they were going to get back pay anyway. The president’s daughter-in-law, Lara Trump, chimed in with, “It is a little bit of pain but it’s going to be for the future of our country.” Mr. Trump bragged that affected employees told him to hold out as long as he needed to because they support him on the wall. Dr. Smith said these brazen examples show a lack of concern for working people. “We live in a country which is a plutocracy run by oligarchs. They don’t care about us,” he said. Slavery reparations as penance at Princeton Theological Seminary?